The Udderbelly Festival returns to the Southbank for its sixth hilarious year, from 10 April 2014. 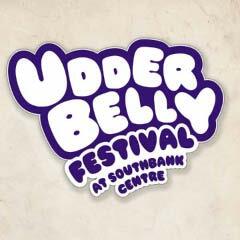 Running from 10 April to 13 July 2014, Udderbelly Festival is a 410-seat theatre inside an upside down purple cow at the Southbank Centre. Featuring one of London’s largest outdoor beer gardens, Udderbelly presents dozens of shows, from comedy to circus to family shows to cabaret. This year’s highlights include Al Murray, LIMBO, Marcus Brigstocke, Meow Meow, The Showstoppers Improvised Musical, The Tiger Lillies and Tony Law.